Here's a Marmitesque name you'll love or loathe: Froffee Coffee. Next time we're pootling down Hamilton Road (see map), I won't be in too much of a hurry to point out their sign to The Boy, given his "th" versus "f" pronunciation predicament. That risible rhyme didn't inspire confidence. Then in we stepped to find plenty of room, lots of customers (though no newspapers), an interesting food menu and even a separate smoothie menu. Optimism's a fickle mistress. Chap took several attempts to jot down our order, but hey. Ten minutes or so later, he reappeared to say sorry, no pittas: panini OK? Sure, I said. A moment passed, back he came to say sorry, no raspberries for the smoothie. Er, cranberry juice is fine, ta. You know that feeling? Time passed. Finally, Andy's ham/egg/chips turned up with no cutlery. More minutes elapsed. Hurrah, my chili chicken panini and Grenvyle's sarnie. No pot of tea, no mustard and one shared napkin. They appeared chronically understaffed, as if half the team had phoned in sick or were at lunch themselves. Maybe it was our waiter's first day or there was a hidden camera. Comically inept service apart, food and coffee were pretty good. Let's assume they were having a bad day at the office. 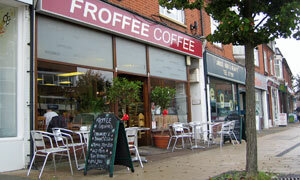 Froffee Coffee could do with Yoffy lifting a finger. If it was a car -- Lancia HPE. If they were passing by -- Jack Douglas.